Arlington is the epicenter of recent college graduates working as paralegals, consultants or in information technology. They fill the high-rise apartments or group homes lining Wilson Blvd., Fairfax Dr. and the Orange Line from Rosslyn out to Ballston. Every Thursday night, the 20-somethings descend upon Clarendon, living the dream of being out of college and having enough money to blow on too much booze (and maybe run into neighbors Ryan Zimmerman or Alex Ovechkin). Then, every Friday and Saturday night will be a mass migration to Buffalo Billiards, Adams Morgan or the edgier Bloomingdale for a little taste of the District. Arlington County has one of the highest percentages of college graduates in America and the greater share of them are from somewhere else (i.e., it’s fully of some seriously educated peeps). They all seem to have attended Penn State, Michigan State, Duke, Virginia Tech, Ohio State, Carnegie Mellon, or the one that seems to dominate every bar, JMU. What is slightly depressing is that approximately 95% of these graduates wouldn’t be able to explain why it’s named Arlington County — even though 43% of them love going to Monday trivia night. Lucky for them, after this post, they will be prepped for tonight’s shenanigans in Clarendon and be able to impress their non-@GhostsofDC following friends. So, let’s start from the beginning … way back when the original G-Dub was around. The Residence Act of 1790 allowed for the establishment of a permanent seat for the new United States Government and it gave full authority to President Washington, to choose the location. They set the deadline of December 1800 for the new capital to be ready. Sites were considered in New Jersey, upstate New York, Delaware and Pennsylvania. However, southerners didn’t want their nation’s capital in the north and vice versa for northerners. Thus, the compromise of putting it at the confluence of the Potomac and Eastern Branch (now Anacostia) Rivers was chosen. A perfect diamond of 100 square miles was selected from land in both Virginia and Maryland to form the new federal District. Andrew Ellicott (i.e., the Quaker dude who founded Ellicott City, Maryland) and his assistants placed boundary stones (i.e., after which the new Bloomingdale bar is named) every mile. Fourteen of these stones outlined land in Fairfax County, Virginia. Congress arrived in the new capital, which was an awful, swampy and muddy place (it really, really sucked to live here back then), passing the District of Columbia Organic Act of 1801. This codified the incorporation of the District of Columbia and divided it into two counties, Washington County on the Maryland side and Alexandria County in Virginia. Residents of the District were no longer from Maryland or Virginia, and with the stroke of a pen were disenfranchised, losing their representation in Congress (no taxation without representation!). The city grew slowly over the following decades, but steadily in Washington County, both north and east of the Potomac. Locals in D.C.’s Alexandria County had anticipated a much larger uptick in business with an increase in land sales and commerce, however this failed to materialize. The county was in steep competition with the Chesapeake and Ohio Canal on the northern side of the Potomac, depressing commerce in the port city of Alexandria. Alexandria was also a major market in the slave trade and word was spreading that northern abolitionists in Congress were looking to end slavery in the District, which would sink the slave-based economy even further. To make matters worse for the former Virginians, Congress had prohibited the federal government from establishing any offices in Alexandria County, significantly depressing real estate and land prices compared to growing Washington County. All of these circumstances galvanized a strong base of supporters in Alexandria to push for retrocession. From 1840 to 1846, the movement petitioned Congress and the Virginia legislature to approve giving the county back to the state of Virginia. On February 3rd, 1846, the state legislature agreed to accept the county if Congress approved the transfer. On July 9th, 1846, Congress approved and passed legislation for the retrocession. President James Polk signed it into law the next day. Retrocession was formally accepted by the Virginia General Assembly and completed on March 13th, 1847, making Alexandria County part of Virginia again. The county maintained the name Alexandria for 73 years until the General Assembly of Virginia voted to change the name to Arlington County in 1920 to avoid confusion with the City of Alexandria (the city was formally incorporated in 1852 using county land). Okay, but where did that name come from? Let’s take this further back … to the 17th century now. Henry Bennet, The 1st Earl of Arlington. There was a guy by the name of Henry Bennet, the 1st Earl of Arlington. He lived in England between 1618 and 1685 (he never set foot in Virginia). Okay, so that’s it? No, not really … there’s more. His name was applied to a plantation along the Potomac. Arlington Plantation was the prominent Custis family homestead on Virginia’s Eastern Shore. Arlington Plantation had ties to another plantation along the river banks called Abingdon, closer to Washington. In 1778, John Parke Custis purchased Abingdon to be closer to Mt. Vernon, the home of his mother Martha and stepfather George Washington. In 1802, George Washington Parke Custis, John’s son, inherited Abingdon Plantation and the following year built a large home on the land. Originally, he wanted to name the home Mount Washington after the first President and Martha. The rest of the Custis family lobbied for him to name it after their homestead on the Eastern Shore, so ultimately, it was named Arlington House. He built the home on a hilltop looking down over the Potomac river with sweeping views of the recently established District of Columbia. The Custis family was a prominent and wealthy family in Alexandria County, living for years in the mansion. They had a number of children, but only one daughter survived into adulthood, Mary Anna Randolph Custis. As Mary was growing up, her distant cousin Robert would often visit the estate and the two were fast friends. Robert went off to West Point and after graduating returned to marry her on June 30th, 1831. If you don’t already know this story, this is the part where it gets really good. The Robert that I’m referring to is Robert E. Lee, Confederate General of the Army of Northern Virginia. For 30 years, Robert and Mary lived a comfortable life both at Arlington House and at Robert’s duty stations in the military. 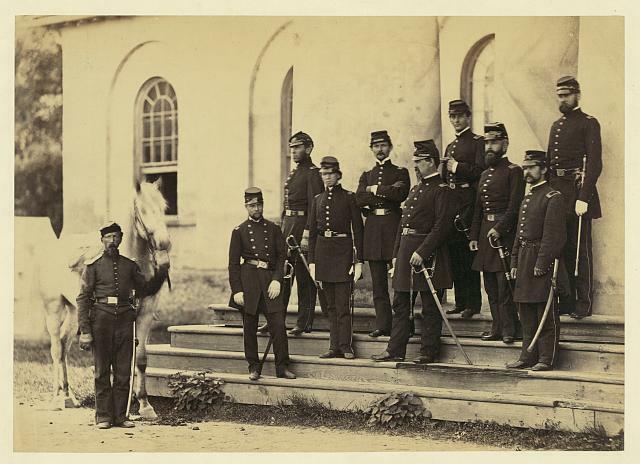 At the outbreak of the Civil War in 1861, Lee was a colonel and offered command of the entire Union Army. While he disapproved of Virginia’s secession from the Union, he could not take up arms against his home state. At Arlington House, he wrote a letter of resignation on April 20th, 1861 and shortly thereafter, headed to Richmond to report for duty. Robert E. Lee never set foot in Arlington House again. Shortly after Lee’s departure, the Union Army occupied the estate and made it the headquarters of the Union’s Army of the Potomac. In 1864, the estate was legally confiscated by the federal government of the United States due to Mrs. Lee’s failure to pay her property taxes. That same year, Union Quartermaster General Montgomery C. Meigs (a Georgian who had served under Lee) selected the home’s rose garden as the site for a Union cemetery out of spite for Lee’s treasonous decision to lead the Confederate Army. So, to close out the story and answer the question … as previously mentioned, in 1920, the Virginia General Assembly renamed Alexandria County to Arlington County, honoring Virginia’s favorite son, Robert E. Lee. When you’re out in Clarendon tonight, just remember the key points and you’ll impress your friends. Arlington County is named after Arlington House, the former home of Robert E. Lee (now at Arlington National Cemetery). Arlington House was almost named Mount Washington by George Washington Parke Custis, Martha Washington’s grandson … but ultimately given it’s current name after the Custis family homestead on Virginia’s Eastern Shore, Arlington Plantation. Happy Thursday. Stay out of trouble and tweet us @GhostsofDC when you’re out tonight.